We can't give you a quote from Bart Van Logistics, but we have hundreds of drivers waiting to offer you a great price. Have a question for Bart Van Logistics? No problem, send them a message and they'll email you back as soon as possible. If you have a more general question you might find it answered in the FAQ, or you always contact one of our brilliant customer service team. * Bart Van Logistics won't be able to see your email address. Bart and his co driver were prompt, efficient and hard working! Thanks! Bart was fantastic, helpful and honest. Driver was fantastic, was very professional and knew exactly what to do/ how to load up the van, which was very comforting when doing a big move. The service was very efficient and our move 3hr30 across the country only took just over 6hrs including loading a 2 bedroom flat and stopping en route to pick up a couple of other large items. Overall, I would highly recommend. Bart was incredible and made our move from London over to South Wales completely stress-free. He was polite, efficient and careful with all our things, which were packed very well in his Luton van... our two bedroom flat took up about two thirds of space in the back and all our most fragile things (iMac, art, TV etc) were secured with straps. We were so pleased with his service and would highly recommend him for your move. SECOND TIME WITH THEM. I WAS SO PLEASED THE FIRST TIME I DID NOT HESITATE TO USE THEM AGAIN. GREAT PEOPLE. He did telephone and explained he was stuck in traffic. They could not have been more helpful. That is why I have booked them again. Amazing service and super nice attitude. The guys were professional, helpful and very gentle with the items. Couldn't be happier! Also we finished way earlier as they are professionals and know how to proceed quickly. Definitely recommended! Both guys were excellent in their conduct and very hard working, nothing to much trouble for them, they help move a heavy sofa bed upstairs, which nearly killed us all , but didn’t complain once ! And very quick , will definitely recommend. A job well done! Bart was great: courteous, conscientious, and got our things safely to our new home. He had the van packed and unpacked in record time (with care!) I'd highly recommend him to anyone looking to hire a man and van. The driver was 30 minutes late and I was not contacted. He also brought a friend with him even though I asked for 2 spaces available for my partner and I to ride with him. But he was friendly, helpful with the boxes and a good driver. Bart was fantastic! Him and his colleague were lovely, efficient, respectful and overall made our move a much better experience! Highly recommend! Very efficient and helpful. Would definitely recommend and use again. Customer service was also very helpful! It my first time using this service and I’m satisfied! My Driver was slightly late but due to circumstances out of his control. He called to explain. The two guys were very efficient and polite. I also moved from a London warehouse where they had to lift and carry very heavy items down a ladder in an attic room!!!!! They drove to Sheffield and it was a very long drive with much traffic. Again very friendly and polite. They never complained. I was anxious about the whole move but it went smoothly under the circumstances, I.e. ladder and long drive. We had a brilliant experience with these guys. 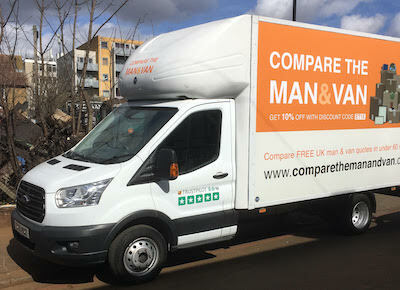 The first van called to say the job they were at was going to much longer than estimated by the people who contracted them, but the Compare the man and van customer service were extremely helpful and organised another van right away. The men were fantastic, really polite, professional, and got all the furniture moved in super-quick time. And the van was easily big enough with blankets and straps. All furniture arrived unscathed. Couldn’t fault any part of the service. Thank you!